If you’re after a quick canape/appetiser type dish that is also low FODMAP, then look no further. This classic combination needs no alterations – other than to watch out for over consumption – to be FODMAP friendly, which is awesomesauce. This can also be turned into a tossed salad with small amounts of the Balsamic glaze drizzled on top. Just as delicious, with much less work. Balsamic vinegar is low FODMAP in servings of 1 tbsp and contains moderate amounts of fructose in 2 tbsp. servings. As the glaze is reduced by half, so should these measurements. You don’t need much of the glaze, anyway. Cherry tomatoes are low FODMAP in servings of 1/2 a cup, so don’t consume more than four or five sticks is you are still figuring out your tolerances. Mozzarella cheese is lower in lactose, so small servings are permissible. Each stick should only have a very small amount – say, 1/2 a tsp. of cheese – so four to five sticks should still be okay. Choose good toothpicks, so they don’t splinter in your mouth. Been there, done that. Pour the Balsamic vinegar into a small saucepan and bring it to just below the boil, before reducing to s simmer. Watch it while it slowly reduces by a third to a half (stop at your desired consistency) and then take it off the heat immediately and pour into a ramekin. Not much more than an hour or two before they’re required, cut the cherry toms in half, tear up the basil leaves and dice the Mozzarella cheese. 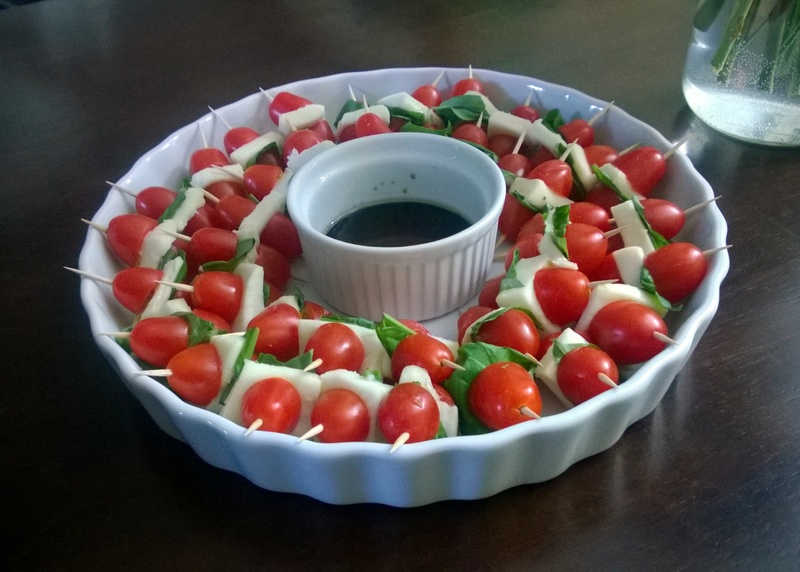 Skewer them onto the toothpicks in the following order: top half of tomato, basil, cheese, bottom half of tomato. Arrange however you’d like and refrigerate until 15 minutes before they’re served, to take the chill off. This entry was posted in Salads, Vegetarian or Vegan Entrees or Sides and tagged appetiser, appetizer, balsamic vinegar, basil, canape, Caprese, cheese, cherry tomato, dinner, entree, FODMAP, FODMAP friendly, FODMAPS, fructose friendly, fructose malabsorption, fruit, gluten free, healthy, home-cooked, homemade, low FODMAP, mozzarella, Mozzarella cheese, tomato, vegetarian. Bookmark the permalink. Looks yummy… beware the balsamic reduction though… as it has been reduced, the fructose is more concentrated than normal. A low FODMAP dip might be a nice substitute if fructose is a huge trigger (I make tzatziki). Thanks Ashleigh. 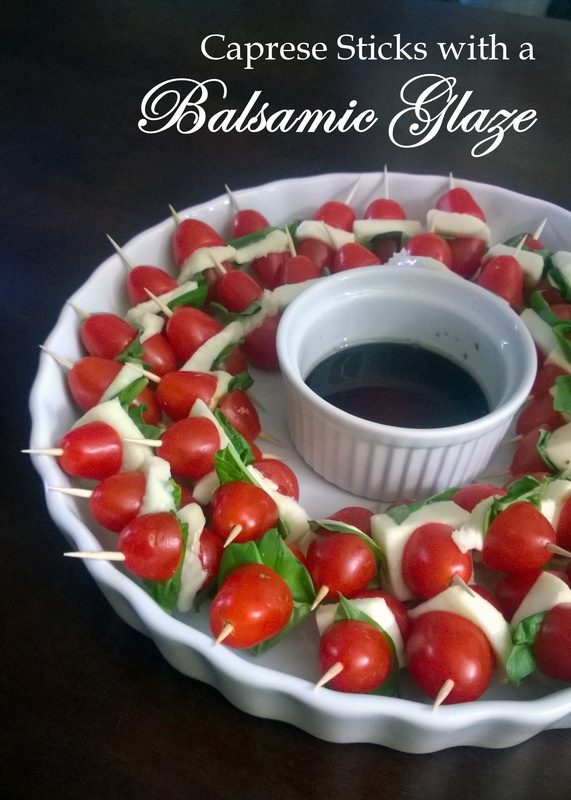 🙂 Yes, you’re correct about the Balsamic glaze – I mention that in the FODMAP notes section. Tzatziki sounds lovely, too. Might have to give that a try.